If anybody has a few stuffed vultures lying around the house, Lenny Litman would like to borrow them to lend atmosphere to his Copa Club for the engagement there of Bela Lugosi, the vampire man of the movies. …Mr. Litman is also in need of a “machine that makes spiderwebs” for the occasion…. Dracula flapped into town yesterday and skittered up and down Pittsburgh streets – but he didn’t scare anyone at all. 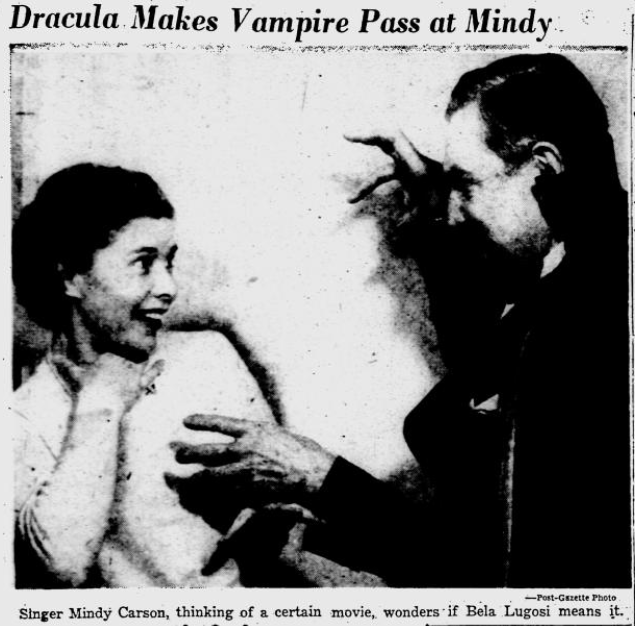 Bela Lugosi, the Batman, here for a week’s horror-klatsch at the Copa, couldn’t even scare meltin’ Mindy Carson, syrup-voiced sweetie who’ll be offering “Candy and Cake” to the customers right across Liberty Avenue at the Carousel. Well-protected by an entourage of six men, Miss Carson allowed Mr. Lugosi to call on her in her suite at Hotel William Penn. He clawed up his hand, lowered his eyebrows and glowered. Miss Carson laughed, then burst briefly into somng as proof that Mr. Lugosi can’t do away so easily with the competition from across the street. Anyway it eas a good try by the veteran vampire, and he was just as pleased as anyone that Miss Carson, first magnitude young singing star, escaped undimmed. He got some attention in the lobby and walking the streets, but not because he scared anyone. People just noticed the familiar face of the handsome man. He’s over six feet tall and straight, and yesterday he wore a tan belted polo coat and cap to match. Miss Carson said it wouldn’t make any difference at all in her singing to have Mr. Lugosi set up shop across the street from her. All she knows id the two places are going to be decked out differently this week. There’ll be no cobwebs or coffins on stage at the Carousel, the way Lennie Litman has those props, peopled with assorted zombies set up in the Copa. Mr. Lugosi has been making a good thing out of scaring people for some 23 years – a year longer than Miss Carson has been kicking around this planet. He has been in this country, having originated from Hungary, for 30 years, but at first was a hot romantic lead in various plays. When “Dracula” hit Broadway, Mr. Lugosi was it, and he has been it ever since, doing the same role again and again in the movies, sometimes playing hide and seek with Frankenstein’s monster, and a couple of other monsters named Abbott and Costello. This will be his first night-club hitch and he intends to do more of it, blending humor and horror. He doesn’t drink and smokes only cigars. Miss Carson, not knowing which end of a cigar is edible, can offer him “Candy and Cake,” if he wants to go from the Copa to the Carousel to get it. 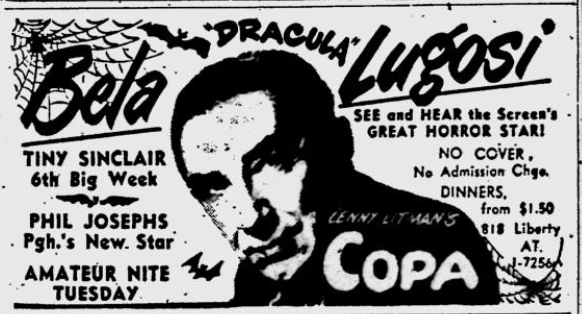 Pittsburgh: Bela Lugosi broke in his new night club act at the Copa. He used comedienne Tiny Sinclair in his act and after his Dracula the two worked to good results in a nine-minute comedy stint.